Here I look closely at a “workspace” I’ve set up in Accordance 10 to study the Septuagint. As I mentioned in a previous post, the NETS, while not perfect, is the best English translation of the Septuagint on the market. I have been really glad to be able to access it. The Original Languages Collection also includes the older and still helpful Brenton English translation of the Septuagint. By going to “Set Text Plane Display” (available easily by right clicking from within a pane, or from Accordance’s “Display” menu, or by the shortcut ⌘T), you can change the theme/color of the individual text. If you wanted the LXX to stand out, for example, you could change it to the “Vintage” theme which makes it a nice, pleasing yellow, as in the picture at right. In fact, I’ve changed the colors on my Greek Tools (the LEH Lexicon) and Reference Tools (The IVP New Bible Commentary)–just so they stand apart a bit more as references. Being a long-time user and now reviewer of BibleWorks, I have been fine with the keep it simple but powerful philosophy. However, it really is a nice touch–especially if you’re looking at a screen for a long time–to be able to customize themes and colors. There are other ways to do searches without triple-clicking (for example, Amplify, which I discuss here), but triple-clicking is the quickest way I’ve found so far. At this point I did run into a little bit of difficulty. 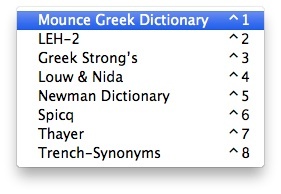 Mounce’s Greek Dictionary is set as the default Greek lexicon. And triple-clicking always goes to the default lexicon, i.e., whatever is first in the list. 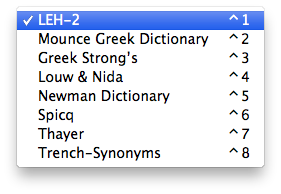 Working with the LXX, I wanted the LEH lexicon to be the one a triple-click would look up. But Mounce comes by default in the first position. So even with the LEH open, triple-clicks would look up in Mounce. 15 minutes searching through menus, icons, and Preferences and 10 more minutes in Accordance’s help section gave me no solution. Finally I turned to the Accordance Forums and–voila!–my answer. Not an immediately intuitive way forward, but I was grateful for the help. That done, I now have my LXX workspace just how I like it. Speaking of help, Accordance has multiple sources of support, from active user forums (in which Accordance staff participate) to extensive help files. The podcasts are good, too (index here). Because the layout/interface change from Accordance 9 to 10 was pretty significant, I looking forward to hopefully seeing updated podcasts for 10 that reflect this. Right now there is this episode on Accordance 10. I have a Greek New Testament workspace set up similarly. 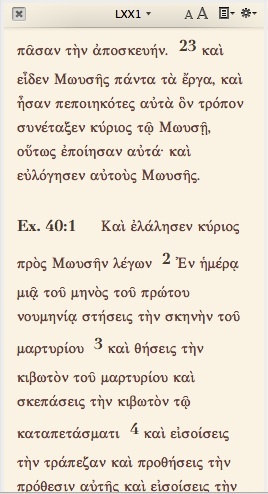 The Original Languages Collection has the Greek dictionaries/lexicons you can see above–Mounce works well for the NT, and I love that it has word frequency counts. (Although you can easily get this and more from Accordance for any given word.) As far as I can tell, I have to change the default Greek dictionary back to Mounce when I’m in my NT workspace, if I want triple-clicking on a word to lead there. The Original Languages Collection also comes with Ross’s Hebrew Grammar. This Dictionary (CDCH) is an abridgment of the 8-volume Dictionary of Classical Hebrew (DCH), the first volume of which appeared in 1993. The DCH was the first dictionary of the Classical Hebrew language ever to be published. Unlike other dictionaries of the ancient Hebrew language, which cover only the texts of the Hebrew Bible, either exclusively or principally, DCH records the language of all texts written in Hebrew from the earliest times down to the end of the second century CE. That is to say, it includes not only the words used in the Hebrew Bible, but also those found in the Hebrew Book of Ben Sira (Ecclesiasticus), the Dead Sea Scrolls, and all the ancient Hebrew inscriptions. Previous versions of Accordance had tiered-levels within individual collections, so that the Library collection still had intro, standard, and premier. So, too, with the Scholar’s collection: intro, standard, and premier. I found this time-consuming to navigate whenever I’d look at Accordance 9 on their Website, so the simplification in Accordance 10 (there is no tiering in the Original Languages Collection) is a huge improvement. It streamlines the decision-making process for those looking to get into Accordance. The Original Languages Collection, as the Accordance site notes, has resources close to a $2,000 print retail value. That’s not a padded figure reflecting already electronically free public domain resources, either. I am impressed with the $299.99 price tag on this collection. And I’m especially impressed that I can have all I currently need to use for text-based Septuagint research in one place. Two thumbs up for this collection. I don’t know if it is included with your copy, but I’ve really enjoyed using in Accordance the MT-LXX parallel tool by Emmanuel Tov. It is a word-by-word comparison of Ralphs’ LXX with the unpointed Hebrew from BHS. 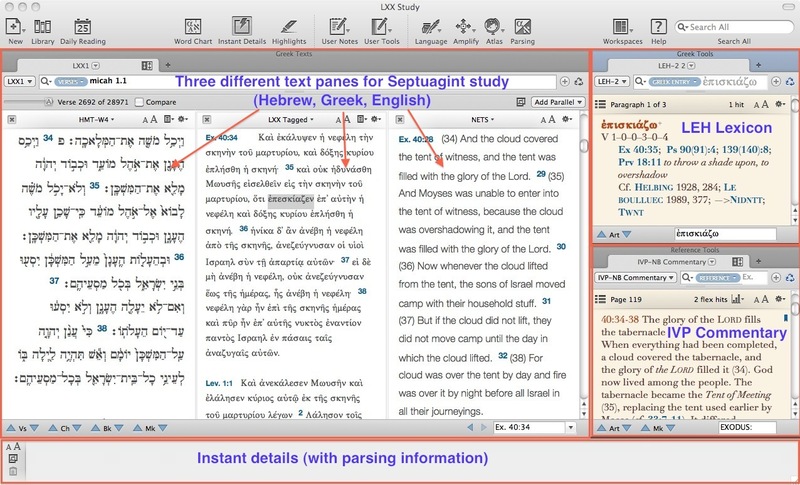 Accordance also allows you to do some powerful grammatical searches with it so you can easily find how often a particular Greek word is used to translate a Hebrew word. It’s not part of the package they gave me for review, unfortunately. I have used that same parallel tool in BibleWorks 9, though, and I love it. But I’d also love to see how Accordance makes use of it! I see it’s available in a couple add-on mini-collections… did you get it through one of those? Looks like it’s also available as a stand-alone. Looks like I bought it more than two years ago as a stand-alone. In Accordance it’s very useful as it correctly scrolls with both the LXX and the MT even when the versification is different. Also, all the siglia and abbreviations are hyperlinked so you can just hover over it and the corresponding entry will show up in the instant details. And again, if you own a tagged LXX and a tagged MT (like BHS-W4) then you can do some complicated grammatical searches and use the LXX-MT parallel to bring up the corresponding passages; then you can pull up the charts and graphs and get some good analysis information. Sounds awesome. Thank for filling me in! I’m definitely going to look into it.